From 90 to 165 € the night I book ! 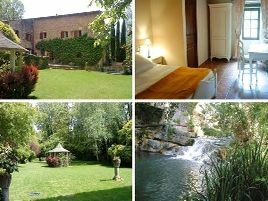 This old oil mill, fully renovated, is located at the foot of the village of Jouques, beside the river, 25 km from Aix-en-Provence and the Luberon. Large, pleasant garden. The names of the rooms are inspired by the surrounding countryside: Camargue, Luoberon, Sainte-Victoire and Alpilles, and their attractive decoration reflects this. The old press and millstone, displayed in the dining room, are reminders of the former life of the mill. Warm and considerate welcome. .
4 rooms with shower, WC and air-conditioning. 65 euros (1 pers. ), 80 euros (2 pers.). The closest station is Meyrargues, located at 10 km. The closest bus is Jouques > Aix, the station/stop is about 0 km.